Known as actor BRIAN QUINLAN, Swansea born Brian was educated at Gowerton Boys Grammar School and made his acting debut at the age of 15. Brian trained for the stage at the Leatherhead Repertory Theatre, Surrey with the well known drama coach, Marion Naylor. He appeared in numerous plays, musicals and tours and his performance in 'The Diary of Anne Frank' won him the Best Supporting Actor at the International Drama Festival, the same year as his performance as Romeo in 'Romeo and Juliet' won him the Richard Burton Trophy. 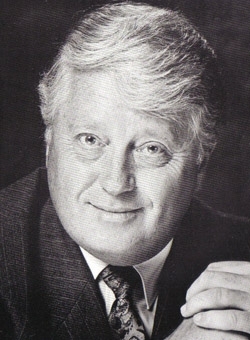 His performance as the Prosecuting Counsel in 'The Vigil' won him a contract with the BBC and there followed many years of working as a radio and television actor in productions such as 'The Life and Times of Lloyd George' with Philip Madoc; Return to Treasure Island' with Brian Blessed; the comedy series, 'Three Up Two Down' and many, many more. He has worked with Dirk Bogarde; Lee Remick; Dyan Cannon; Elke Sommer; Robert Hardy; Richard Todd; Christopher Cazenove to name but a few. Brian has also received nominations for Best Actor for his roles in 'A Man About the House' and Oscar Wilde's 'Lord Arthur Savilles Crime'. More recently Brian was appointed Swansea City Entertainments Officer, organising all the City's major events. He also acted as Artistic Director at The Grand Theatre, Swansea, producing and directing their annual pantomime and repertory season, featuring stars such as John Inman; Ruth Madoc; Bobby Crush; Nigel Pivaro; Little and Large; Emma Chambers (Alice in 'The Vicar of Dibley'); Rachel Thomas ('Arsenic and Old Lace'). Brian has brought a wide range of shows to Wales featuring the likes of Shirley Bassey; Tom Jones; Everley Brothers; Don Williams; James Last Orchestra; Freddie Starr; Jim Davidson; Joe Longthorne to name but a few. He has fascinating anecdotes to impart about this period that are simply enthralling. Brian has appeared in many pantomimes; lectured on Arts Administration, travelled extensively, directing stage musicals and acting as Casting Advisor for a London based theatrical company and, for the last few years, has written, produced and directed many pantomimes. Brian was recently awarded the Commendation Medal by the National Operatic and Dramatic Association. Brian is much in demand as a host, after dinner speaker etc and for the past eight years has been the Master of Ceremonies/Narrator for the Annual Swansea Festival of Remembrance. He is a brilliant raconteur and his tales of experiences in all aspects of the entertainment industry and the many interesting celebrities he has met during his years in show business, captivates his audiences far and wide.